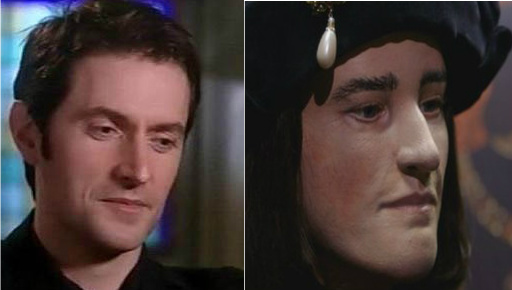 Does Richard Armitage Look Like Richard III? Mashup pic is my crude photoshop work. LOL! Knowing how capricious casting directors can be–but surely they wouldn’t try to cast anyone else in the role. Let’s see–Brad Pitt as Richard III? (Oh, please!) Matthew McConaughey as Richard III? (Even worse!) Richard Armitage? Be still my heart! It’s a bit spooky isn’t it? Especially as he was also named after Richard lll and he and his dad have an interest in him. Now if we could just get that movie underway with RA playing the lead, all would be complete! I think the reconstructed Richard looks more like Lucie Griffiths to tell you the truth, especially the chin! Amazing! I would really like to hear RA check in on this whole thing Just a statment “Isn’t this cool” or something, . He can say it fumblingly if he wants to – just say something. Am I out of line? Maybe they should check a DNA sample from RA while they still have the slides on the microscope! I remember seeing a ‘who do you think you are’ where someone ( a rugby player? )found kings in his lineage. The researcher said it isn’t uncommon but most of us can’t trace it- especially where children have been illegitimate. Personally I think that the people who made the Richard III statue had RA in mind. How do they know he had a pointy nose from a skeleton??? Call me a cynic. I TOTALLY agree, Beverly. Earlier today I had this tingling up my spine and thought, “Hmmm. I think Lin Foxhall is an RA fan.” LOL! Louie, I love to tease, but honestly, it wouldn’t shock me if we found out she is. LOL! It don’t think it’s a conspiracy, just maybe some subconscious similarities happening. Either way you can count on me to buy a ticket to the movie! I agree with Beverly and RAFrenzy…. The comment about Lucy was hilarious! You found the perfect picture to illustrate your point! There was also a comment somewhere that Daniel Day Lewis also resembles the likeness. I watched the special last night, and I completely agree that there was no bias. 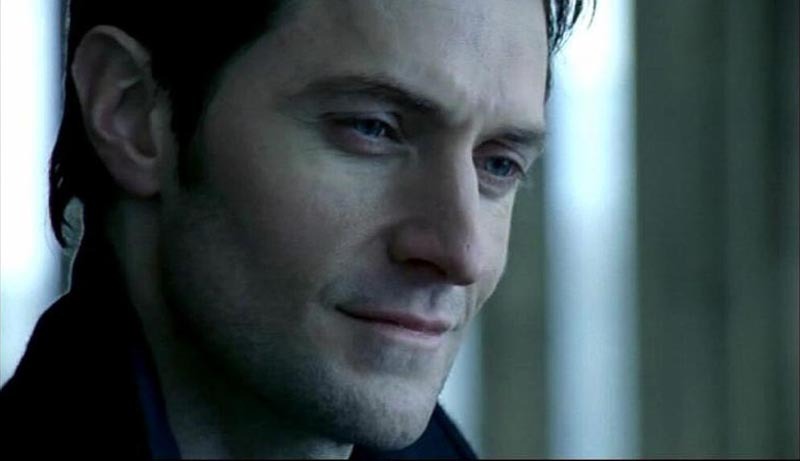 However, I think it’s important to note that without the information of how this was done, given Philippa Langley’s favor of Richard Armitage and then seeing the reconstructed face’s eerie resemblance to him, it was a fair conclusion. “The shape of the face had to be based entirely on the scans. It may seem impossible to build someone’s cheeks, nose, and eyebrows from a piece of bone. But there are lots of clues, she says. Like teeth. The nose used to be one of the toughest features to recreate because it’s made of cartilage. But recent research has unearthed a formula that allows one to predict what the soft nose would look like from the underlying bone, she says. Even the shape of the brow can be guessed at, although the number of lines on someone’s forehead will not be apparent. The ears are the hardest thing to get right. All that can be deduced from the skull is whether the person has earlobes and where they sit on the side of the head. About 70% of the facial surface should have less than 2mm of error, Wilkinson says. One area where they are using guesswork is in the amount of flesh on a 15th Century face. I think Richard Armitage will be a fine Richard III, but I can not help wishing that the role could be taken by Christian Bale, who besides being closer to Richards age (at death) also is one of the most talented and versatile actors England has produced. If Charles the Bold happens to be in the RIII film (Richard being fugitive in Burgundy for the 2nd time) I would suggest the part goes to actor Edward Bennett RSC and a fabulous understudy Hamlet at the Novello, when David Tennant had hurt his back), who not only is very talented, but also looks amazingly like the Burgundian Duke. Richard Armitage Community Pinterest Board Does It Matter If Richard Armitage Looks Like Richard III?